A remarkable cleanser, this oil-free, anti-ageing, exfoliating gel effectively removes every trace of make up, excess oil and impurities. 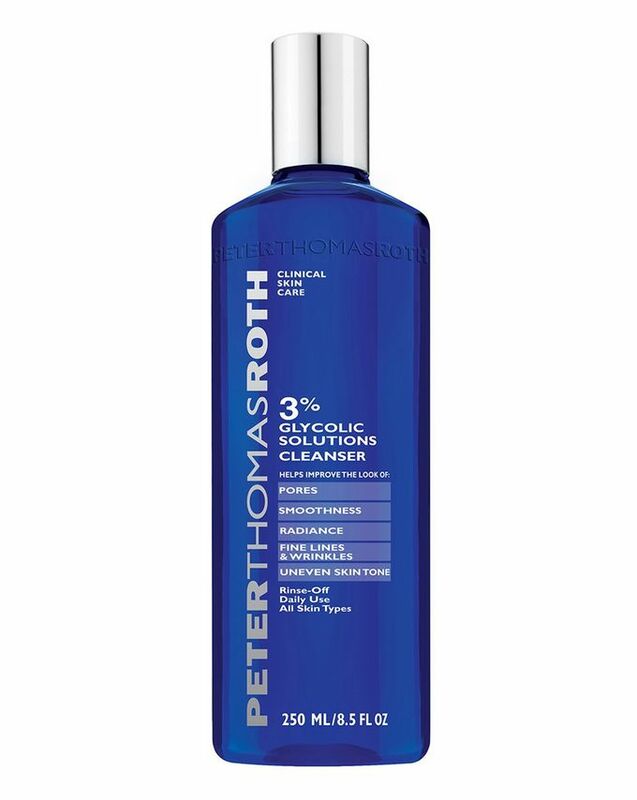 But it’s much more than just a remover – enriched with a gentle dose of glycolic acid, this cleanser helps to improve the look of pores, promoting smooth, bright clarity and reducing the appearance of fine lines, wrinkles and uneven skin tone. Pretty impressive for just one step in your radiance ritual. 3% Glycolic Solutions Cleanser by Peter Thomas Roth achieves more than most other cleansers. The oil-free, anti-ageing, exfoliating formula not only removes every trace of oil, make up and other impurities to leave your complexion clean and refreshed, it also imparts a gentle dose of 3% glycolic acid. This alpha hydroxy acid exfoliator helps to slough away dead and dulling cells, improving the look of pores, fine line and uneven skin tone while promoting a smooth, bright, clear canvas for the rest of your skin care regime. Alongside this, panthenol (pro vitamin B5) helps to nourish and hydrate skin, while arginine renews its outer layers. Overall, you couldn’t really hope for a better first or second step on your daily road to radiance. Combination, oily & problem skin: Use once or twice daily, or as often as needed. Normal, dry & sun-damaged skin: Use two to three times a week at first, increasing to daily usage if well tolerated. Apply a small amount to moistened skin with fingertips. Work into a rich, foamy lather and massage gently into skin for one minute. Rinse thoroughly with lukewarm water and gently pat dry. For external use only. My skin was dull, full of blemishes and acne scars BUT when I used this cleanser, I was quite shocked at how glowing my skin was. My make-up genuinely glided on better after this and you could still see my GLOW through my makeup! Only bad thing about it is the design of the bottle top. I kept it in a bathroom drawer and somehow the lid opened without me knowing and it must have been slowly emptying out everywhere. What a waste. Other than that... I will definitely be making this my staple cleanser!